To ilustrate this mobile marketing feature that integrates print to online publishing, Goss International introduced the technology called RSVP. According to Brian Lawler, " the product is a two-dimensional bar code in a small graphic (about 1 cm. square) with a small logo included. 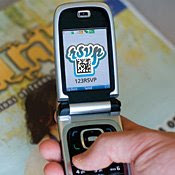 The bar code is printed into an advertisement, and can be read by a scanner or (and this is the differentiating part) a cell phone camera. The idea promoted by Goss is that the RSVP code will become a well-known symbol for market bargains, sales and discounts. Once the code is captured, the cell phone can send the customer to a web page, or alternatively, the RSVP code initiates an event that sends a digital coupon back to the cell phone. It can b e low-sophistication, or high-sophistication". Brian continues explaining "the idea is that you could be reading your newspaper, and could photograph an advert featuring an RSVP code with your cell phone. The cell phone would then receive a digital discount coupon (as a text message) that you could then redeem at a store (or online) when buying the product. In exchange, the marketer can get valuable information about the success of their advertising campaign, about markets, demographics and similar information. The customer’s cell phone number or text ID is not given to the marketer, according to the salesman in the Goss booth. The cost is also attractive. Initial creation of an account costs just $50, and a number of individual RSVP codes and promotions can be purchased in modestly priced bundles. This pricing model is designed to get people to use this technology. It’s not punitive, as so many of these cross-tech marketing schemes can be. So, you might ask, why is Goss International promoting this bar code technology. They make web presses. Why dabble in something so different from their core business? The answer is simple: they are working to drive advertisers to newspapers, and to drive customers to printed publications. If RSVP works, and I think it will, the incremental drive of consumers to print could increase ad sales, print revenues, and help to deliver properly-focused advertising to the right consumers. Goss told me that they have written the software to drive over 200 cell phones so far (the iPhone isn’t done yet) so the middleware exists now to read the codes and initiate the communication between the phone and an RSVP marketing message. In a recessionary economy (the Bush Administration insists that this is a “prolonged downturn”) every penny spent on advertising must be spent effectively. I see RSVP as a clever way to pinpoint marketing efforts to get them into the right hands, and to get people to read the newspaper". This is not just aplicable to newspapers but also to publications with large circulation like magazines, catalogues and the Yellow Pages.